(TibetanReview.net, Jun24, 2015) – Despite warnings and threats of severe punishment by China, Tibetans in many parts of their occupied homeland celebrated the 80th Tibetan-calendar birthday of their exiled spiritual leader, the Dalai Lama, on Jun 21, reported Radio Free Asia (Washington) Jun 22. The service reported on instances of celebrations in several parts of Qinghai and Sichuan provinces. The report said that on the Churathang, an open area in Draggo (Chinese: Luhuo) County of Kardze (Chinese: Ganzi) prefecture, Sichuan Province, monks and villagers set up a religious altar and offerings in front of a large portrait of the Dalai Lama. And they performed incense-leave burning ceremony and said prayers for the Dalai Lama’s long life, the report cited an exile Tibetan with local contacts as saying. And at a place called Choru in Kardze County, “both laypeople and monks observed the day with different activities,” the report cited a second exile Tibetan with local sources as saying. The report also cited a local Tibetan source as saying that in the Draser Village of Golog (Guoluo) County in Qinghai Province, Tibetans celebrated the day in their homes since public markings of the day were banned. And in the province’s Gepasumdo (Tongde) County in Tsolho (Hainan) Prefecture, public celebrations with an incense-leave burning ceremony and firework displays were reported to have been held. 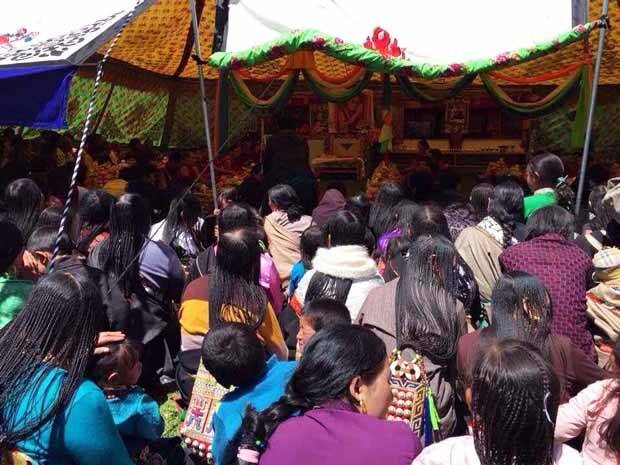 In the province’s Pema (Banma) County, Golog (Guoluo) Prefecture, Tibetans carried out prayer ceremonies in local monasteries. Not all celebrations were successful. A religious fasting retreat organized in another part of Pema County was prevented by the police, the report added. Still, Tibetans went to the local market to free hundreds of fish, dedicating their saved lives to the Dalai Lama’s long life, the report cited a local source as saying, speaking on condition of anonymity. China’s main focus is on preventing celebration gathering and activities on Jul 6, when the Dalai Lama birthday is usually celebrated or marked.